Scrounging for a scrap of paper to write down a few things we need at our vacation house this week, I found this list crumpled in the corner of the purse I brought. Normally, in my frantic rush to get things done, I would have glossed over this list and just started my new one. I reuse paper for list-writing with the absurd notion that my attempt to be frugal with bits of paper will help the planet. But, right now, I am on vacation and I am trying to live in the present moment and to pay attention. To hear the end of summer crickets, to feel the temperature in the air and the wind on my face, to smell the road-kill on my morning walk, to see – really see – what my eyes are looking at, as Rodney Yee instructed us in the serendipitous yoga class he taught on Tuesday. It’s just about impossible for me to stay in the present moment. This week, as my friends with children one year older than mine are dropping them off at college, I am already jumping to a year from now when we will be taking my daughter to college. I look at the list. It brings me to a moment in time in my recent past. When did I write this list? What was going on? 1. Yearbooks. That was a note to myself to order yearbooks for the kids before the deadline. The year before, when my daughter was in 10th grade, I missed the deadline. I push everything to the deadline and even then assume I can eek past the deadline and still get by. Not this time. There were no yearbooks left. My daughter’s face crashed with disappointment. I apologized with shame at my carelessness. “It’s okay Mom,” she gently but sadly reassured me. What kind of mom neglects to order yearbooks for their kid? As usual, I was self-absorbed. As usual, she pretended not to mind. I was not going to make that mistake again. 2. Old Navy. I needed to order jeans for my son. Old Navy has the only pair that fits him. Regular Style Husky. He is growing but is not tall yet. He is at that awkward stage where he is stoking up for his big growth spurt. Most brands are too long and too tight in the waist. He will be big. He’s grown a lot this summer, stretching out a bit. Like a puppy, his feet are now enormous, but his body hasn’t caught up yet. He’s already outgrown the jeans I ordered for him from that to-do reminder. 3. Haircut. The only item on the list that’s about me. It must have been time for my every 7 weeks trim – my personal hygiene errand. I can’t even remember to make a haircut appointment any more. I have to write everything down. Otherwise I get closed out of the Saturday timeslots at the salon. 4. Key. Key? What was this? Had we used the spare key and not put it back in its hiding place? Was it when we replaced the front door and needed to get new keys made? Were we taking care of my sister-in-law’s dog? Why did I need a key? Key to my heart? Key to my soul? What mystery was locked away? Why can’t I remember anything anymore? 5. College Prep. Phew, this is a loaded item. Like I could just check this off as another item on my to-do list. Get her ready for college. Check. No problem! Her friend’s mother found an SAT/ACT prep class and I jumped on it. I was grateful that another mom had done the research and found the perfect thing: 5 Sunday afternoons that would focus her productively with test preparation skills, with a friend. Done! If only it were that easy. 6. Black Bean Chili. This pinpoints the time for me. The weekend prior to Monday January 14th. I had signed up on the neighborhood meal train to make dinner for my friend Agnes who lost her husband, suddenly, so sadly, on November 6th. She was eating more vegetarian choices and so was I. This was the perfect meal. Easy, keeps well, and I could make enough for both her family and my family. I was struggling with how to be a good friend to her. This was the least I could do. 7. Aspirin. My husband does not like to talk about his health. Whenever I come up with my latest and greatest thought about being healthy, he is quite interested if it is abstract, mildly interested if it is an initiative I am undertaking for my health (Yoga! Meatless! ), and aggressively disinterested if it is an initiative I demand he should undertake for his health. I haven’t completely cracked this code. If I can present the concept lightly as something he can opt in to, as opposed to a didactic “You need to do X” he is more amenable. And so it has been with aspirin. He has read the evidence that aspirin is an anti-inflammatory that may prevent heart attacks, stroke, and even cancer. So, we started taking baby aspirin this year. 1a. Take care of business before the deadline is upon me. Procrastination cultivates stress and is selfish when other people are affected. 1b. Pay attention to my daughter. Just because she says it’s okay doesn’t mean it is. Value what is important to her and try to make it happen when possible. Don’t be careless. 2. Buy clothes for my son that fit him properly. Just because he doesn’t care what he wears doesn’t mean that I shouldn’t help him find clothes that make him feel good about his body and how he looks, especially as he enters high school with some anxiety and curiosity about girls. 3. Take care of me. No need to be a martyr. It’s okay to develop a personal style that doesn’t require a fortune and a lot of professional help. Enjoy my longer, softer, less edgy hair. 4. Trust my children with their own key. Be proud of their increasing independence as they take bigger steps away from me. Welcome them home with a good night kiss when they come back safe and sound. 5. Be there for my daughter as she dives into this exciting time, trying on who she might want to be when she grows up. May she have fun with her friends, enjoy her senior year as a leader in the school, and explore her many options for college next year. 6. Sustain my friendships. When I am busy busy busy, I am not good at doing the everyday things that keep a friendship going. Make time to care. 7. Tell my husband that the reason I care about his health is because I love him. I want him around to enjoy our life together as we launch our wonderful children further and further into their own lives. 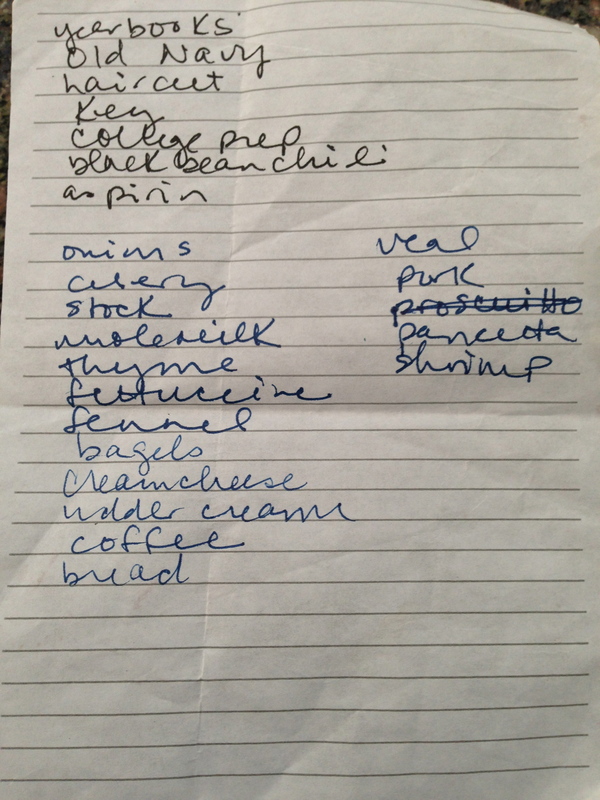 As for the rest of the list, created at different times on this mini time capsule, the middle set of ingredients (with the exception of shrimp, which was for another dinner) is for my husband’s Veal Bolognese Sauce (adapted from a recipe of Mario Batali’s). It is delicious. My husband makes it regularly. (On the weekends, I go grocery shopping and he cooks at least one sauce that provides leftovers.) It just so happens that we have leftover Bolognese Sauce waiting for us for when we return from vacation. But I am getting ahead of myself, as usual. Right now, I need to buy some coffee for the vacation house and some udder cream (a wonderful moisturizer for sensitive skin) for my husband’s skin which is taking a beating away from home. After I pause and appreciate the moment. Lovely! Just what I needed to read today.